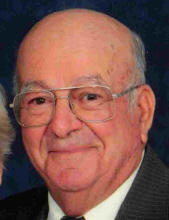 James Ivan Howdyshell, 88, of Bridgewater, passed away Wednesday, January 23, 2019. Ivan was born in Mt. Solon on July 27, 1930, a son of the late Ruby (Shull) and Lester M. Howdyshell. He was a 1948 graduate of North River High School, part-owner of Dayton Equipment, and was a member of Montezuma Church of the Brethren. Ivan was married twice, first to Elizabeth Wenger Burkholder Howdyshell, who preceded him in death on Oct. 15, 1992, and on June 6, 1993 he was united in marriage to Lillian Irene (Price) Simmons Howdyshell, who survives. He is also survived by siblings, Dillie Reese of Dayton, Juanelle Simmons of Harrisonburg, Marlene Rollins of Sebring, FL, Jackie Howdyshell of Harrisonburg, and Larry Howdyshell of Mt. Solon; many nieces and nephews. He is preceded in death by siblings, Janet Duane Click, Sheryl Howdyshell, Beverly Howdyshell, Catherine Annalee Auville, Freddie Howdyshell, Carlyn Howdyshell, Garland Howdyshell, Martin Howdyshell, Franklin Dee Howdyshell, and Lester Ray Howdyshell. Burial will be private at Beaver Creek Cemetery. A memorial service will be conducted 3 PM Saturday, Jan. 26, 2019, at Montezuma Church of the Brethren, with Pastors David R. Miller and Ron Wyrick, and nephew Mark Reese officiating. The family will receive friends following the memorial service at the church. Friends may sign the guest register anytime at Johnson Funeral Service in Bridgewater where the casket will be open. In lieu of flowers, memorial contributions may be made to Montezuma Church of the Brethren, 4937 Ottobine Rd., Dayton, VA 22821. To send flowers or a remembrance gift to the family of James Ivan Howdyshell, please visit our Tribute Store. Officiating will be Pastors David R Miller, Ron Wyrick and nephew Mark Reese. Burial will be private. The family will receive friends following the memorial service at the church. "Email Address" would like to share the life celebration of James Ivan Howdyshell. Click on the "link" to go to share a favorite memory or leave a condolence message for the family.